I awoke again about 5:00; DH around 5:30. Messed around the room and had another hearty breakfast in the Lounge. Headed out about 8:30 by taxi to the Lama Temple. The taxi ride was quite an adventure. Traffic signals and painted lines on the road seem to be only suggestions. Everyone has the attitude “I dare you to hit me.” Organized chaos, and random actions by all involved. 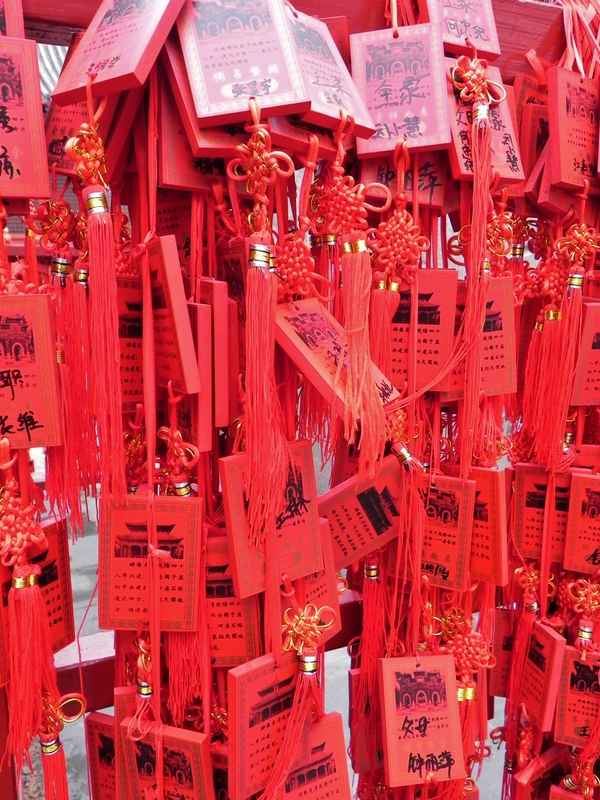 The Lama Temple was an incense filled Buddhist temple, with active worshipers and monks. One huge Buddha statue after another, each in a pavilioned hall. Similar to the Forbidden City in layout, but here the central theme was Buddha. The last Buddha, of course, was the biggest (35 feet and carved out of a single piece of sandlewood) but the halls were so dimly lit, it’s doubtful many of our pictures turned out. In one hall, there was a congregation of monks chanting, which, with the wafting incense, was surreal. I managed to surreptitiously capture a video of the chanting – the visual part of the video is awful (finger and all), but at least you can hear the sound. 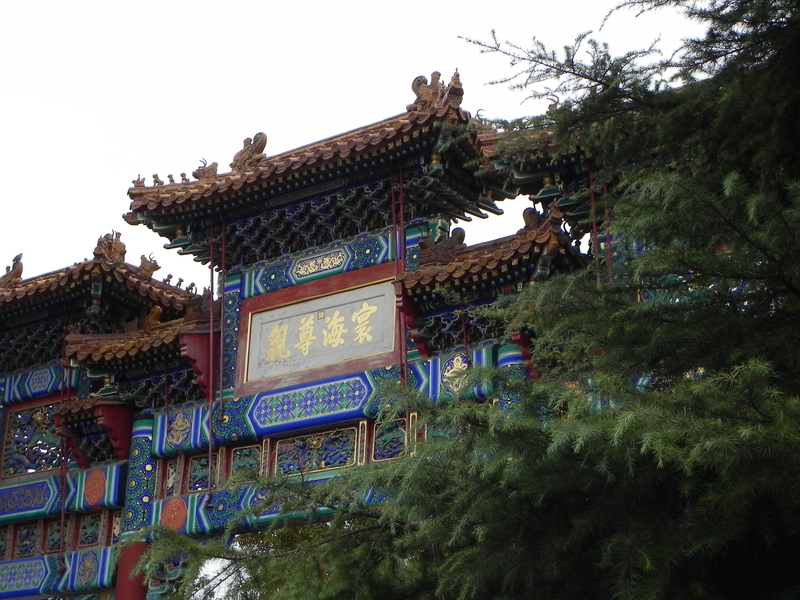 Then we limped across the street and down a narrow alleyway to the Temple of Confucius. This was similar, but here there were giant stele stones all over, with ancient Chinese calligraphic writing, and statues of Confucius. The courtyards were filled with old cypress trees, one purportedly 700 years old. I got pictures of an old geezer in front of the really old cypress. 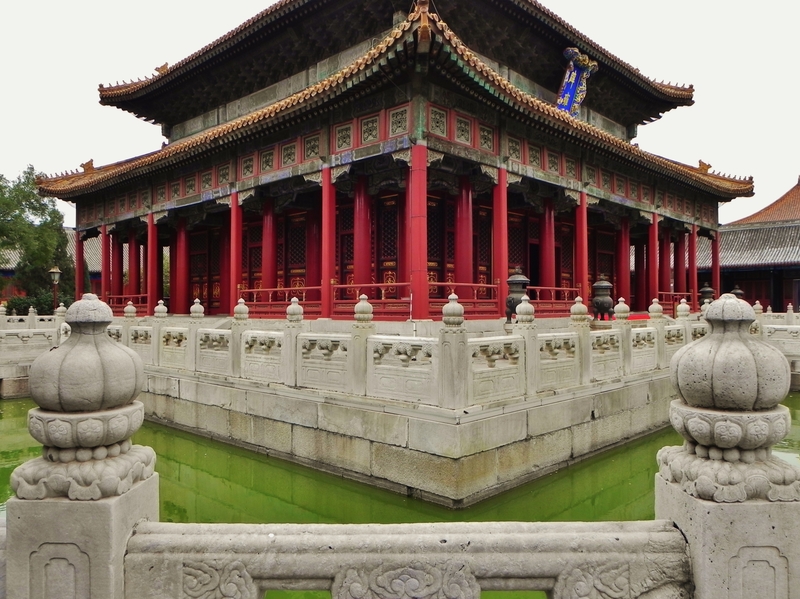 Just west of the Temple of Confucius was the Beijing Imperial College where scholars from ancient China would come for their higher education. The Central Hall was in the center of a very green pond crossed by stone bridges. 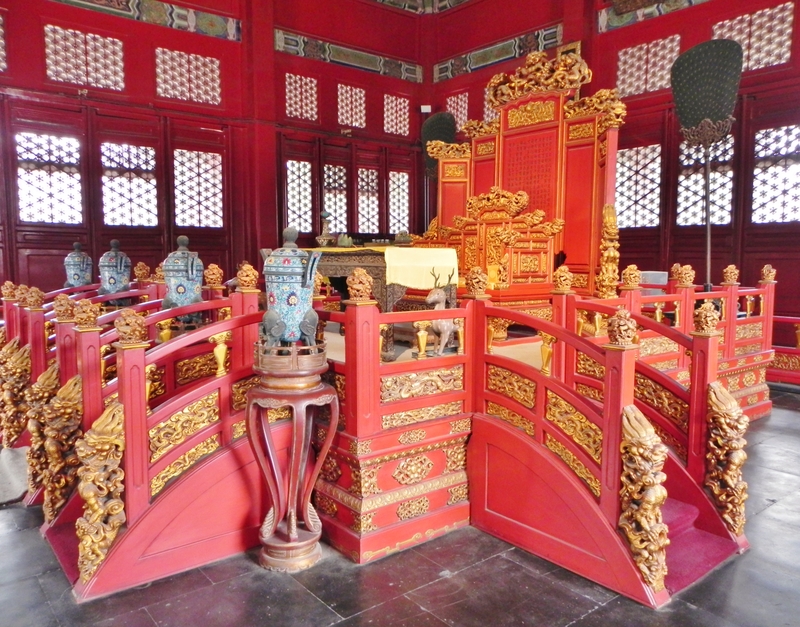 In the center of the Central Hall was the throne where the Emperor would give his annual speech to the students. They would not have seen him seated on his majestic throne of course as their foreheads would be pressed on the ground as everyone had to kowtow to the Emperor. Behind the Central Hall was another statue of Confucius, with bright red tags dangling from the fence surrounding him, keeping us tourists away from the statue. Guess these must be prayers or wishes (confirmed later that this was correct). An interesting museum was in one of the side halls, but it was all in Chinese, so not very helpful. One building had over 200 stele stones with all of the Confucian Classics engraved on them in attempt to preserve them for posterity. Then we were off for a very long hike to Nan Luogu Xiang Street. Along the way we passed by the Dadu Art Museum, under heavy guard. Must be somebody important inside. By now it was 11:00. Our legs and feet were finding it painful going, but we made it to the famous red lantern covered street, and finally found a tiny little place to sit down for lunch about an hour later. Nan Luogu Xiang Street is in one of the few remaining hutong areas, filled with shops, little eating places, street food, and even a well-disguised Starbucks. For lunch I had huge plate of fried rice (seemed kind of safe) and DH had an enormous bowl of hot-and-sour soup. His soup came with fried potato chips pierced on a skewer, and sprinkled with hot pepper powder – very spicy. The meal was actually very satisfying. After filling up we walked to the end of Nan Luogu Xiang Street and were fortunate enough to hail a taxi right away. I don’t think we could have walked another step. A much less harrowing ride back to the hotel – the driver was much less aggressive. We dropped our gear back in the room and went upstairs for a Diet Coke and cup of tea. 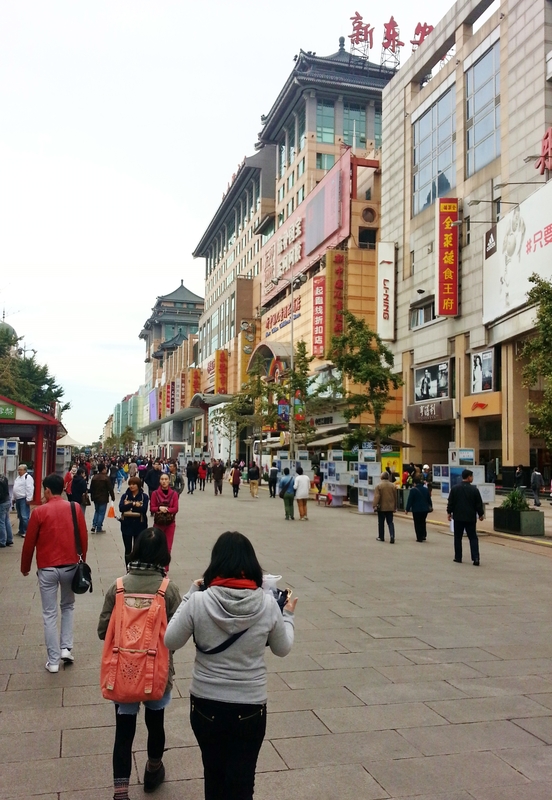 Rested for about an hour and then I went out shopping on Wangfujing Street for batteries for the White Noise Sound Machine, as once again, the transformer doesn’t seem to make it work, just like Russia. 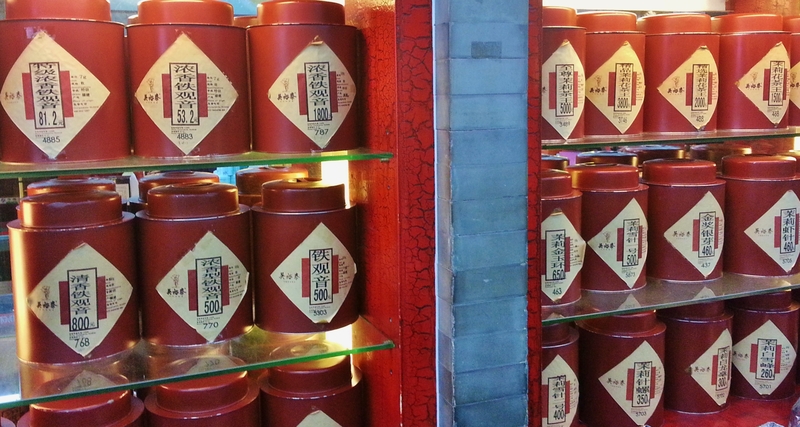 I stopped by a Tea Shop (Wuyutai Tea) and amazingly managed not to buy anything. I did get the batteries and they were amazingly cheap. DH was busy loading pictures and resting his sore worn out old body. With a great deal of effort, we got dressed for dinner and were off to “Made In China” for our Peking Duck. It’s in the Grand Hyatt Hotel in the Oriental Plaza. We got a seat right next to part of the kitchen (separated from us by a glass partition), but not the area where they actually roast the ducks. 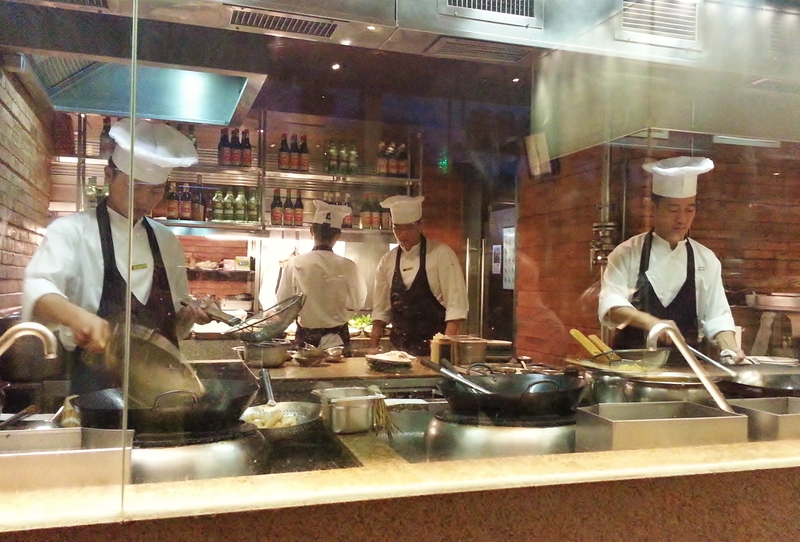 We had a good time though watching the young Chinese chef cooking in his wok. The wok was seemingly floating in a bath of hot water. After he was finished with a dish he would “clean out” his wok by pouring some of the water into the wok with a big ladle. He would scrub it with a bamboo whisk. Water and grease would go flying everywhere, including the glass partition. It was quite a performance. The fried dumplings were scrumptious! And presented in a different way – there was a crispy web that connected all the 6 dumplings together. All of it great! The dessert platter at the end was also heavenly, but we were both stuffed by this time! At the end we struck up a conversation with the single lady from Australia who was sitting next to us. Glad we hadn’t done this earlier as she was very, very chatty. Had a slightly hard time getting a cab back to the Hilton, as the hotels are not very far apart and the cabs refused to take us. They kept telling us we could walk. I guess they didn’t understand we could barely stand, much less walk. We did finally get one, but had to pay an EXTRA 20 yuan to do so.